Naturist campsite Baldarin on the island of Cres in Croatia is located near the village of Punta Križa (literally ‘a crossroad by a cape’) and takes its name from the fact that the village stands on the intersection of routes leading to former shepherd’s villages, which are now holiday spots. The entire Punta Križa area is an ideal destination for true lovers of nature and naturism. Camping is 2/3 naturist and 1/3 textile. - A rocky shore stretches between pebble bays, ideal for diving into the sea or, with some luck, spotting one of the 150 bottle-nosed dolphins living in these waters. 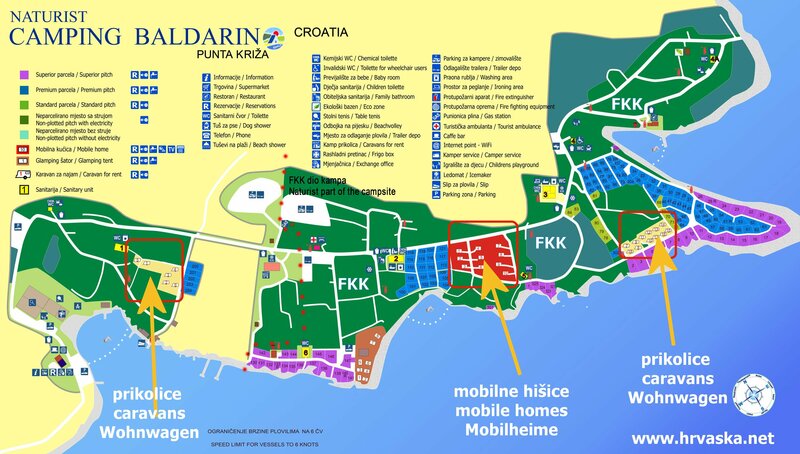 - Mobile homes located in FKK part of the camp. Campsite Baldarin is located in the southern most part of the island of Cres, in Punta Križa. It is the largest and the most famous naturist campsite on the island, located 15 kilometres from Osor and the main island road, in a thick Mediterranean forest next to the 2 kilometres long rocky coastline. Baldarin is known for its maritime zone that is believed to be home to 150 dolphins. A part of the campsite at the entrance is reserved for its regular guests, while most of the campsite is dedicated to naturists. Camping plots are arranged on a terraced terrain close to the sea. Within its surface area of 200,000 square metres the campsite can accommodate up to 1,200 guests at a time. The camping area has a store, restaurant and a bar, while its sports and leisure activities include tennis, beach volleyball, miniature golf, table tennis, as well as table and small-sided football. The campsite has a daily boat connection to Mali Lošinj on the neighbouring island of Lošinj. IN MOBILE HOMES AND CARAVANS THERE ARE NO TOWELS - YOU MUST BRING YOURS !